The descent to the Milioni Gorge is one of the best routes for those who want to find perfectly untouched powder with the help of ski lifts. Due to the need to traverse a little bit and ascend to the crosspiece of the nearby gorge (50 m ascent), the route is the least crowded, since freeriders with ordinary skis and snowboards can’t get here. 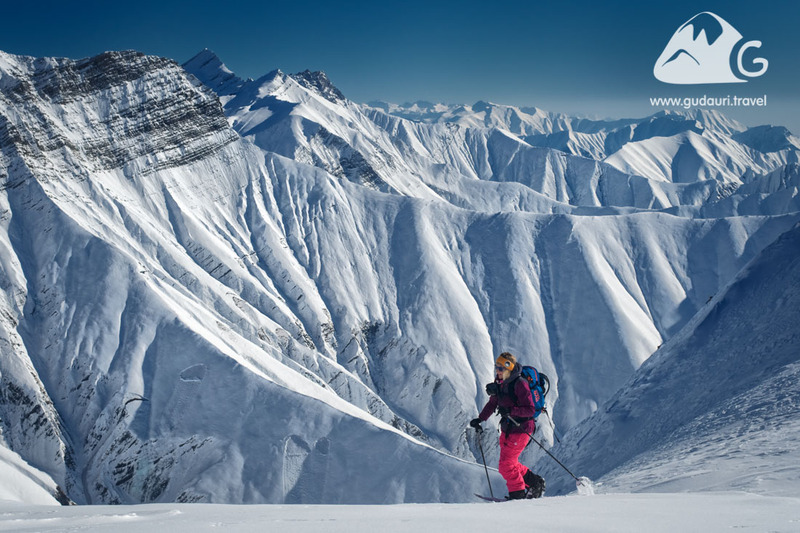 A skitour or splitboard set are essential to reach the beginning of the descent, with only half an hour of easy traverse. The route is very picturesque, and the descent lines are some of the best in the region. In Gudauri, this is the fastest and surest way to find perfect snow with a vertical drop more than a kilometer with the use of ski lifts. The Milioni Gorge lies directly after the Kobi Gorge from the back, on the northern side of the Gudauri Ski Resort with the northern slope exposure. There are several options for descent along the edges of the terrain, and because of this local freeriders call the route "Alaska." The route ends near the village of Kobi on the Georgian Military Road. The steepness of the slopes is 30 - 37º. Set off for the route only in conditions of low avalanche danger, good visibility, and favorable forecast for the next hours. Before heading for the Milioni route, while still at the resort, call the Patrol Police of Georgia (+995 322 418 502) to check if the Cross Pass is open; otherwise you may not return to Gudauri for several days. The route is potentially dangerous due to particular features of the terrain, including a large vertical slope difference and the presence of so-called "terrain traps." Certainly, this route is not recommended for independent passage by riders without corresponding experience. Note: *If the ski lift "Sadzele" is not operating, (this happens on days of increased avalanche danger, hurricane wind, or insufficient snow cover), then you need to take the “Kudebi” lift to the top of the mountain of the same name (3030 m). You will then descend on a ski piste to the north, to the fields where the skitouring ascent begins (see the map of ski pistes and lifts) The beginning of the ascent is from the point 42.50266, 44.51135. Go to the crosspiece on the left (GPS coordinates of the crosspiece 42.50863, 44.51683), then go around the top of Sadzele from the east. Continue another 20 minutes to the northwest to the plateau at the beginning of the Kobi Gorge (GPS coordinates 42.51720, 44.51989, altitude 3010 m.). From there, traverse on a southern slope to the crosspiece in the Milioni Gorge. This route will take 1 ½ hours. You can return to the resort by taxi. Call the driver when you know you’re at the end of the route and ask him to meet you in the village of lower Kobi, at an old bus stop. The standard cost of a 7-seat car to meet you from the Kobi Gorge is 100 lari, and the journey time is 30-35 minutes. If you take this route with a friend (solo runs on this and any other route are unacceptable), you can hitchhike and return to the Gudauri Resort. The choice of a starting point for the route to Milioni depends on whether the lift to the highest point of the resort (Sadzele mountain 2270 m.) is operating or not. The section below, "Getting there," explains the starting point variants and the selection of a descent line. The choice of a descent line depends on your riding level and on the stability of snow cover. You will probably find a couple of tracks from those who were here before you immediately after the crosspiece. But on the right side, having ascended on the ridge, you can find dozens of new lines for descent. If you go down directly from the crosspiece, keep to the right of a big couloir below, circling it to the left, as there is a steep vertical drop. Avoid the descent along the couloir on days of high avalanche danger, as it is a place of accumulation of avalanches. At an altitude of 2400 meters, the slope flattens. Keep to the right of the stream all the way along the gorge until you must turn to the left. Here you need to cross the channel of the stream and traverse on a steep slope to the end of the gorge and then to the village of Kobi and to the road. The whole route is ridable; splitboarders need telescopic poles for the final part of the route. There is often wind and bad weather here, which is why it is better to wait under the roof of an old bus stop for a car, 100 meters to the right of the exit to the road.